Are Republicans or Democrats More Likely to Go Solar? This post is adapted from SolarPulse, a Priceonomics Data Studio customer. Does your company have interesting data? Become a Priceonomics customer. When scientists research how to make solar cells more efficient, and when employees of solar companies try to manufacture and install them at a competitive price, they are not playing politics. But if you listen to politicians talk about solar energy, you might think that scientists and solar manufacturers produce a political product. Democratic politicians praise renewable energy and propose funding for solar research. Republicans are more likely to downplay solar and talk about drilling for oil. But should we really be associating solar with the Left? When it comes to the actions of individuals—rather than the rhetoric of politicians—do solar panels really divide the country along ideological lines? Using data from Priceonomics customer SolarPulse, we reviewed data on 25,000 California households that installed solar panels from 1997 to 2015. We used this data to explore the political leanings of the areas with the highest proportion of solar homes. Our findings refute the link between solar and political affiliation. In California, people who live in areas that elected a Republican to Congress are actually far more likely to buy solar technology for their homes than those who elected a Democrat. What accounts for this difference? We explored a variety of demographic and geographic factors that could contribute to this counterintuitive finding. Our conclusion is that Americans are much more pragmatic about solar energy than the speeches of American politicians would suggest. California leans heavily Democratic. Thirty-nine of the state’s 53 representatives in the House are Democrats, and Obama won over 60% of Californians’ votes in 2012. California produces more energy from rooftop solar panels than any other state. Is this fact powered by the state’s Democrats? To find out, we examined U.S. Census data on the number of households in each congressional district and SolarPulse data on the number of households in those districts that installed solar panels between 2011 and 2015. The result is the percentage of homes in Democratic and Republican areas that went solar. The surprising result is that homes in Republican-leaning areas were five times more likely to install solar panels over the last five years. More than one in every 100 households in areas that elected Republicans bought solar panels in the last five years, compared to just 1 in every 500 households in areas that elected a Democrat. Of course, some voters are more partisan than others. It could be that centrist Republicans and Democrats are less influenced by the link between Democrats and solar panels on the national stage. To test the impact of partisanship on solar purchases, we deepened the analysis by using the Cook Partisan Voting Index (PVI), which scores the representatives of each congressional district based on the partisanship of their past voting. We used the PVI of the district’s representative to classify each California district for which we have data as either Very Republican, Mildly Republican, Mildly Democratic, Moderately Democratic, or Very Democratic. We then analyzed the percentage of new solar households for each of these categories. This further division of areas by partisanship shows that more Republicans go solar and that very liberal areas have few solar households. In fact, in contrast to the perception that solar is a partisan issue, in both Republican and Democratic areas, their more moderate districts have the largest proportion of new solar households. 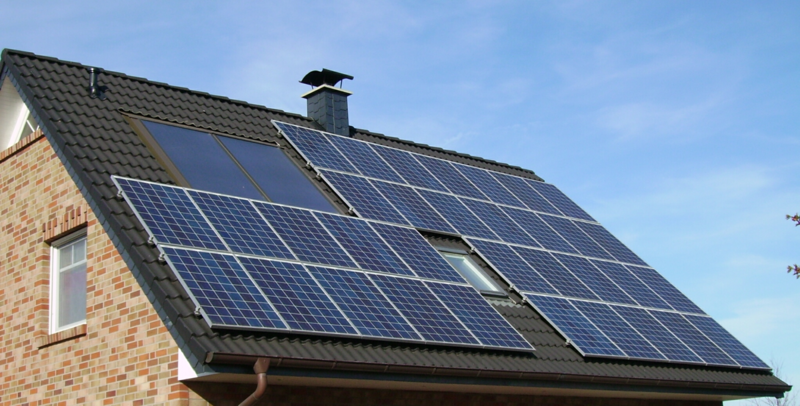 What could be driving these higher rates of residential solar buying in Republican areas? Since wealthy homeowners go solar at higher rates, we investigated whether the Republican districts in this analysis are wealthier than average. Perhaps income levels are responsible for our results. The answer does not seem to lie with income. Democratic districts have (on the whole) a median per capita income that is about $8,000 higher than Republican districts. If income does not explain the difference, perhaps homeownership rates are the answer, since renters are less likely to go solar. The following chart shows the percentage of rented homes in Republican and Democratic districts. The Democratic districts in our California dataset have far more renters: Only 40.5% of Republicans rent, whereas nearly 50% of California Democrats are renters. Home owners are far more likely to invest in their properties, meaning it’s more likely that they would invest in long-term energy solutions such as solar panels. Being a homeowner also means having your own roof—unlike renters in apartment buildings. The higher rates of renting in Democratic districts is likely part of the reason why more Republicans than Democrats go solar in California. But the best explanation is geography. The ideal climates for solar panels are sunny, relatively dry, and warm. Additionally, solar panels are large, so rural areas and spacious suburbs can better accommodate them. In California, Republican districts tend to be in the southeastern parts of the state. These areas are generally sunny, dry, and less densely populated. In contrast, Democratic districts lie in the northern and coastal areas of California. These districts tend to have less ideal weather and higher density. The average Republican district has five more days of sun a year—and, more importantly, has less population density. While the average Republican districts in our analysis has only 47 homes per square mile, the Democratic districts have 1,553. A combination of more space, more sun, and more homeownership makes California’s Republican districts a more ideal setting for solar panels. Although American politicians tend to include solar panels in ideological battles, individuals are much more pragmatic. Our analysis shows that households’ decision to go solar is not driven by political affiliation. Instead, people who live in areas that are sunny, dry, and less dense tend to install solar panels at higher rates. And in California, the country’s top state for solar, that means you’re more likely to see solar panels in Republican bastions than Democratic strongholds. If all politics is local, then solar panels aren’t political at all. Also, the Priceonomics Content Marketing Conference is on November 1 in San Francisco. Get your early bird ticket now.